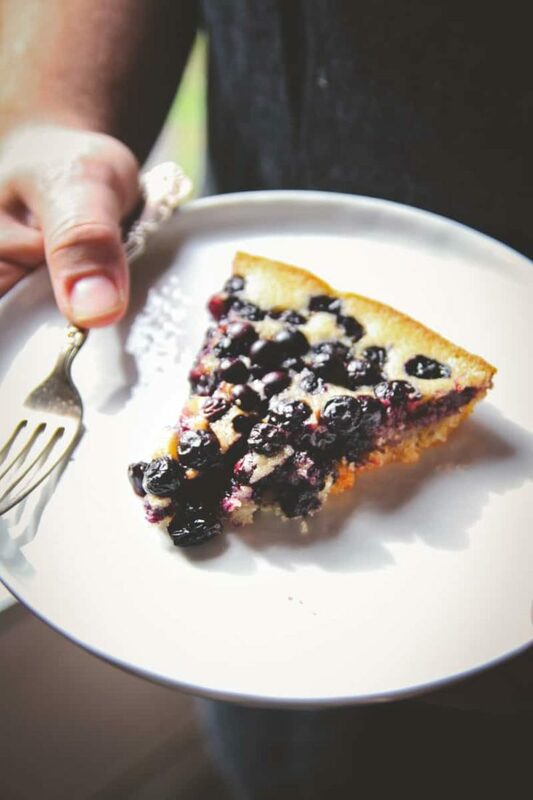 Perfect for making the most out of berry season, this 5 ingredient blueberry skillet dump cake is the easy dessert recipe you’ve been waiting to enjoy! 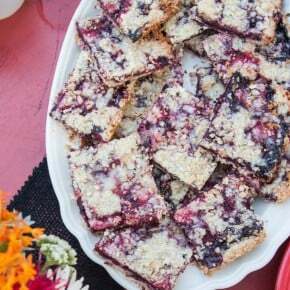 Have you been going to the farmers market on weekends? I have been trying to take weekends completely off of work and blog work (like I told you in this slow cooker Greek chicken and vegetables post) and have been stopping by the farmers market as much as I can, and is it just me, or has this year seen an abundance of berries? I feel like I’ve seen more this year than ever before, and even though I had berries galore, I couldn’t walk past the fresh blueberries and not get them. 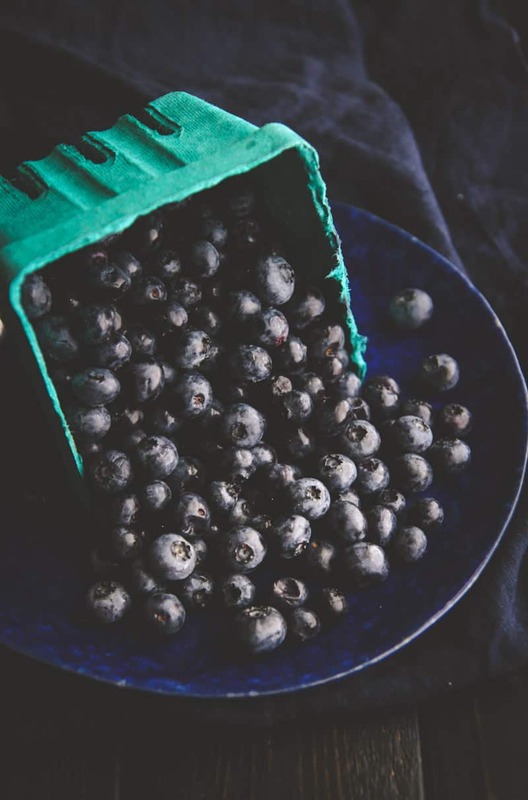 But farm fresh blueberries are a little different than berries bought at the grocery store, I feel like one has to use them the SAME DAY they are picked up from the farmers market, or else they kind of go bad (it may just be me lol). I really had no intention of eating a pint of blueberries by my lonesome, and was feeling a little lazy on the weekend, so I decided to make a dump cake, where essentially all you’re doing is ‘dumping’ the ingredients into a bowl, stirring, and then dumping it into a skillet and baking. 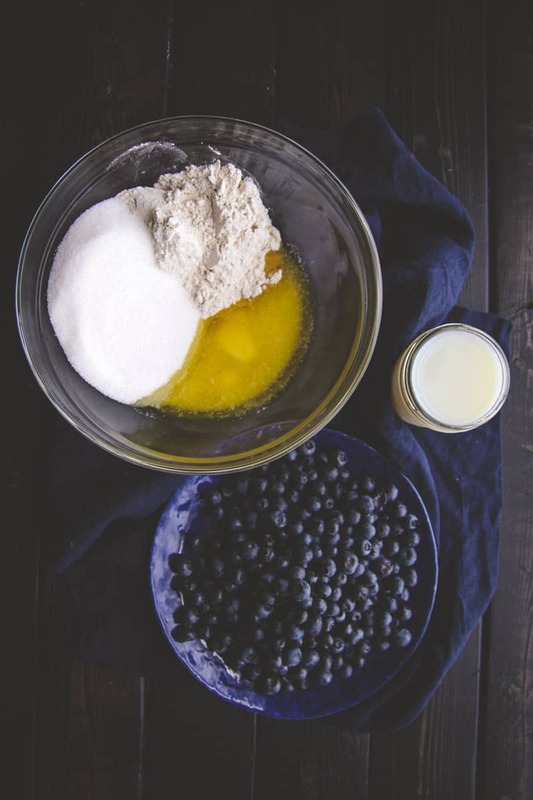 With this recipe, you’re making a quick cake batter in a bowl and then pouring it into the skillet, and pouring the blueberries on top. Pouring sounds a lot more graceful than dumping, does’t it? 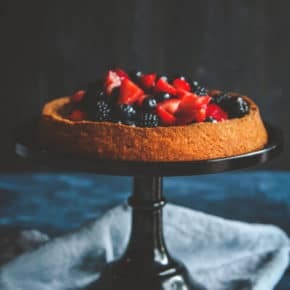 So you can think of this cake as a one bowl cake, a skillet cake, or just an all around amazing blueberry cake, and since this cake is made with only 5 ingredients and it’s Friday – it’s this week’s Five Ingredient Friday recipe! Now, I have to share a funny story with you that makes me giggle every time I think of it: I was once doing a radio interview about my cookbook and they invited the live audience to call in. This very sweet elderly man called in and said that he had purchased his first cookbook and I got all excited thinking mine was his first cookbook he had purchased, but then he went on to say that it was a ‘dump’ cookbook but that is was a lot more complicated than he thought it was going to be, and what did I have to say about that? Whomp whomp. I of course was nice and responded with how I was sorry he wasn’t enjoying that cookbook, but that I could assure him that mine had only 5 ingredient recipes and he might like it. The funny part was, when he was describing the other cookbook, (I have no idea what the title of the cookbook or who the author was)- the one I had no idea about- he kept emphasizing the word ‘dump’ “you’re supposed to just DUMP all the ingredients in” “one makes dishes by “DUMPING” and so on. It took all I had to contain my laughter. Ever since, every time I’m making something that involves a pouring step, I think that I’m dumping ingredients in and laugh. Maybe I’m the only one that thinks it was funny? Preheat oven to 375, spray a skillet with cooking spray or grease it with butter and set aside. In a bowl melt the butter (30 seconds in the microwave does the trick for me) then pour in the flour, sugar and milk and whisk to combine, until no big clumps remain. Pour into the prepared skillet. 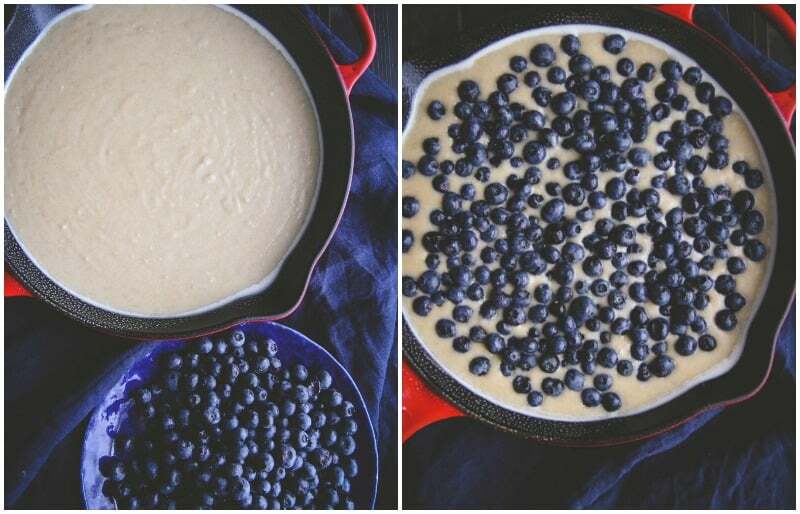 Sprinkle the blueberries evenly around the top of the batter. Bake for 40-45 minutes, or until edges start to turn slightly brown. Remove from oven and allow to cool for 10 minutes. I used a 10 1/4 inch skillet for this recipe. 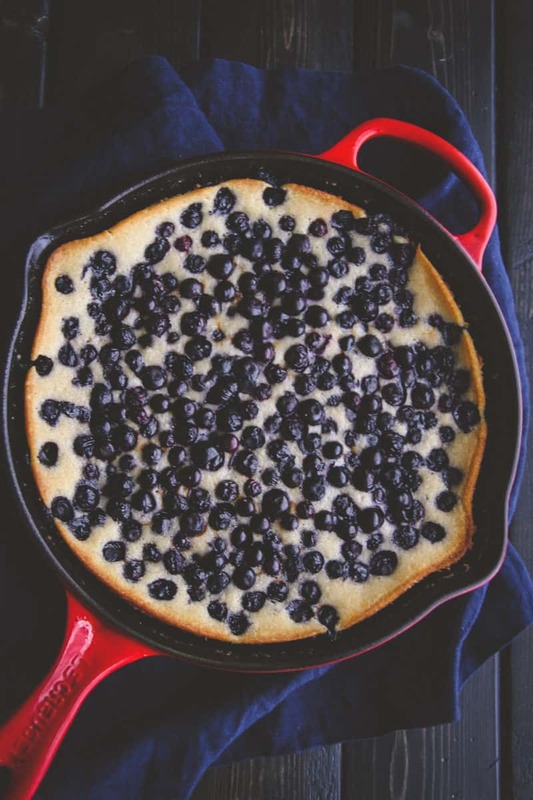 You could use a smaller skillet, the cake would just be a little taller! 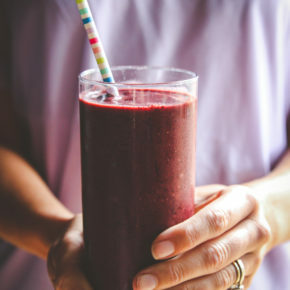 How much lemon juice or zest from lemon skin do you suggest for giving it a lemon blue berry flavor? I love that combination. Oh that might work, I’ve never tried but I think it could work. I’d love to know how it turns out for you! Well, I tried. But this was a flop and not because of your recipe but because of my tweaks. I wanted to make this more keto friendly so I substituted 1:1 Almond Flour, added an egg for binder (as is usual with Keto using Almond Flour) and substituted the 1c. of sugar with 1/2c. of Erythritol, and it was a sloppy mess that didnt even resemble a cake…its more like a topping for cake at this point. I did leave it in the iron skillet & coooed it on the stove from the bottom to try & cook off some of the slop but it’s still a mess. 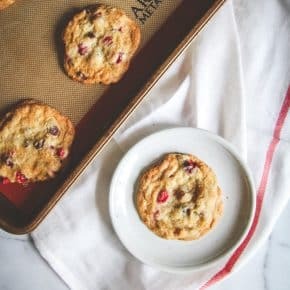 Here’s why I dont Keto-exchange many recipes!